Wondering how much load the SW can Pass thru when in AC Pass thru mode and NOT in Inverter OR AC Support mode. I am sure it is limited to the in and out breaker and wire size connected to it, but is there a limit beyond that? In other words, can the SW actually pass thru any amount of Current / Power, say 4000 or 6000 watts - at least for a few minutes. Maybe even more. Just wondering what the limits of the unit are and what if any effect passing thru high loads might be. Since the AC input has to qualify before transfer to within certain parameters, voltage, frequency etcetera, it would make sense the SW would actually rectify then invert the input before sending it to the loads. If this is the case, the amount pass through current allowable would be the same as the rating of the unit, up to a maximum of 25°C, derating above that. Trying to wrap my head around what you are saying (pardon my ignorance). Are you saying it is always inverting even when merely passing thru from grid to loads? I can turn the inverter and charger off in the SW (but not switch off the SW itself) in the Combox. If connected to an AC source such as the grid or a generator, the combox is still reporting that power is passing thru the SW. Is inverting taking place anyway? Or are you simply saying that the SW is rated for what it is rated for and can (or at least only should) out put what it is rated to output regardless of how it is "getting" that power: inverted from the battery, passed thru from the grid or generator. Pass Thru limits are set by the internal relay contacts. If I recall correctly, my XW6048 has 60A 240VAC rating on the AC relays. They might take a bit more, but I hear welded relay contacts are common in inverters, I never push mine to the limits. Actually the reply is a question of sorts, reading the manual it states the AC in first has to qualify, once accepted bypass current will be passed to loads. 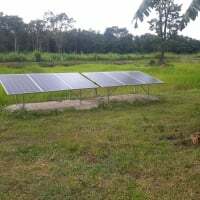 Once the qualifications fall outside the programed parameters, AC will be disconnected and inverter will resume the load support. The specifications for the SW states, Maximum continuous allowable (in pass thru) 30A, for models 2524, 4024 and 4048, so this would indicate it is not rectified then inverted. The question is, since the inverter peak output for the SW models listed are, 11,16 and 16A respectively, should the pass-thru ever exceed that value, a value the inverter cannot support on a continuous basis, the inverter would fault on overload.if the AC disconnected. Please understand I'm just trying to rationalize how this would function as the manual really has no theroy of operation. Currently i only use AC for charging if required, but hopefully that will change when grid becomes available, currently I'm 450 meters from the nearest pole, 1300 meters to transformer where the higher voltage lines are. Thanks, Mike and Mcgivor. Yes welded contacts would equal bad. Not that i was planning on exceeding the limits of the inverter, but was more concerned about momentary or very short loads, say in the 5 second to 3-5 minute range that might get up to 4000W for the longer duration's and 5000W+ for start up surges. Sounds like just stay within the inverter limits for both pass thru and inverting. Specs for the SW 4024 are 3400W continuous, 4000W for 30 minutes, and 7000W for 5 seconds at 25°C. The 48v version is slightly higher in the first 2 but the same for 5 seconds. I continue to tinker with getting my loads more and more balanced both in "normal" use and those larger short loads like vacuums, hairdryers and small microwave. The Autotransformer has helped to "insure" I am not overloading one side of the 240v SW, but if everything came on at once, things might get near the limits. Did not know if the inverter would invert what it could and then pass thru the rest or just shut down if limits were exceeded. Welding of contacts will be a problem if a transfer is made or broken under load, when an arc is most likely to occur, once made, the surge rating is probably much higher, age will also degrade the contact surface making them more prone to failure. Even setting aside the contact arc issue (assuming the pass-though relay is made and stays closed), I'd avoid going much over the pass-through current spec for anything other than a momentary (eg motor start) load. The internal wiring is presumably sized to meet the pass-through current spec, and running say 2-3x the spec current for several minutes seems unwise. Not an answer directly, but a warning... Relay contacts tend not to have a lot of thermal mass (they are generally lightweight so that they can turn on/off quickly). And remember that one equation for power is Power=Current^2 * Voltage... So that if you double the current, you get 4x the heating (Watts). I would suggest that you avoid dramatically large over current situations. However, for example, 2x surge surge power support is a typical rating for a good quality AC inverter (few seconds to a few minutes). And surge current of 5x rated load is common for induction motor starting and even some (older) larger (my experience was with older computer power supplies) electronic power supplies (for a couple of 60 Hz cycles). As long as you are staying within the above surge current/power/VA range, it would seem to be allowed. But, as always, thermal cycling and high temperatures are the enemy of electronics (almost anything physical). At 11 sec, it starts to fall off. right Mike ... it does, and from what you folks are saying, the surge rating for inverting would also be the surge rating for pass thru. That is what was wondering. Could the SW pass thru more than it was rated for in inverting OR supply more than it was rated for from 2 sources - grid/generator and battery? Sounds like probably not. I was kicking this all around in the context of AC Support Mode which has never preformed up to spec in the SW's. 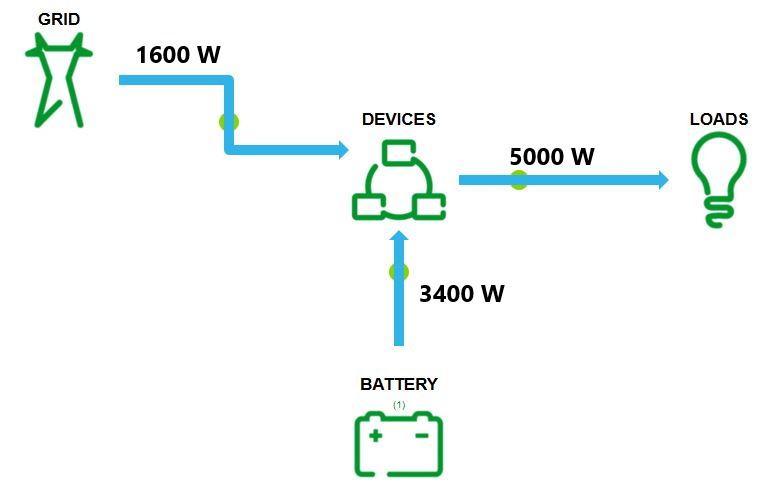 So since knowing the SW will NEVER supply more than about 70% for large loads (except in the cases of perfectly balanced loads like 240v pumps etc), was wondering if it would be OK to have say a 5000 watt load, that the inverter was supplying about 3400 watts of (the max of the inverter) and the pass thru grid was supplying the other 1600 watts. But it sounds like a bad idea.